Truck accidents often result in the most severe injuries and fatalities of any type of motor vehicle accident in the U.S. According to the Federal Motor Carrier Safety Administration, fatal truck accidents occur nearly 11 times every day. These accidents kill 4,000 people each year. Additionally, 100,000 Americans are injured every year in semi-truck accidents, which is not surprising considering the tremendous size and weight of these vehicles. The following is a helpful checklist that you should follow if you are involved in a truck accident. Your safety is the most important priority. Move to a secure location if you can and call 911. Do not leave the accident scene. Put out flares or reflectors to alert other drivers to help prevent a second collision. Get as much information as you can about the truck driver. You’ll need to get the driver’s name, address, phone number, and operator license number. Any additional information about the state of license, insurance provider and policy number, the truck’s DOT number, the vehicle license plate number, and registration is also helpful. You will also need the name, contact information, and insurer information for the owner of the truck and the truck driver’s employer. Be sure to collect the names and phone numbers of any witnesses to the accident. Ask them to describe what they saw and note their descriptions. Take photos of the accident scene and the damage to vehicles, if possible. Note any physical damage and identifiers, such as license tags, logos, and warnings. If you cannot take photographs, take detailed notes. Once the police arrive on the scene, it is important to get the police incident report number, the officer’s badge number, and the police department that is handling the case. Notify your insurance company about the accident. Provide only basic facts about the accident, such as time, location, and who was involved. Do not give a written or recorded statement about the cause of the crash without getting help from an attorney. Serious injuries are not always obvious following an accident. Do not make any comments about your injuries until you see a doctor. Even if you don’t feel any symptoms right after the crash, you should still get a thorough medical exam as soon as possible. Truck accidents can be caused by several factors, such as: driver negligence, poor truck maintenance, bad weather, road construction, heavy traffic, distracted driving, impaired driving, driver fatigue, or many other forms of carelessness. Types of trucking accidents include jackknifes, tire blowouts, rollovers, rear-end collisions, underrides, wide turns, lost loads, T-bones, head-on collisions, and more. Because of the severity of truck accidents, the aftermath can cause major devastation to the parties involved, especially the occupants of passenger vehicles. Whatever type of truck accident occurs, the injuries and damages suffered by the victims can be far-reaching and debilitating. If you are seriously injured in a trucking accident, you may not be able to work for long periods of time. In some instances, you may spend extensive time in the hospital or a rehabilitation facility recuperating from injuries. Broken Bones and Fractures: The amount of blunt force involved in a trucking accident can break bones and leave fractures that are severe and painful. Brain and Head Injuries: Head injuries can range from mild concussions to severe traumatic brain injuries (TBI), which can result in a variety of negative effects. These injuries are likely to be life-altering. Initial symptoms may include nausea, confusion, problems with vision, and other cognitive impairment. Amputated Limbs/Extremities: Limbs such as arms, legs, hands, or feet can be severed during the impact of an accident, or they may have to be amputated if the damage is extensive. Burns: These injuries tend to happen more with commercial trucks than in regular car accidents. There is a greater risk of gas tanks rupturing and catching on fire. Burns can cause painful and disfiguring injuries. Spinal Cord Injuries: The impact of a truck accident can injure or damage the muscles or nerves in the spinal cord, leading to partial or complete paralysis. These types of injuries cause severe pain and require extensive rehabilitation. Neck and Back Injuries: The abrupt force that hurts drivers and passengers in an accident can result in neck and back injuries, which can lead to severe pain or paralysis. Internal Injuries: The force of impact can cause severe internal trauma in a serious accident. These types of injuries involve the liver, pancreas, bladder, spleen, or kidneys, and they can be very hard to treat. Broken Ribs and Abdomen Injuries: Injuries to the abdomen can be painful because they can affect vital organs. Broken ribs that are not diagnosed and properly treated can cause severe and long-lasting pain. Lacerations and Cuts: Glass, metal, plastic, and other materials on a vehicle can cause serious cuts and wounds, resulting in scars that are disfiguring or can become infected. 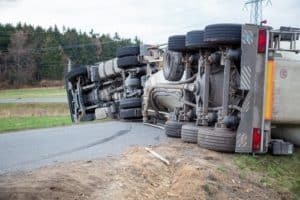 Wrongful Death: Fatalities can occur in a commercial truck accident and may bring on a wrongful death claim on behalf of the victim’s family members. If you or a loved one has been injured in a trucking accident, you need the experienced Savannah truck accident attorneys at the Spiva Law Group to fight for you. If you need compensation for your injuries, you shouldn’t try to negotiate on your own. We are here to fight for you. Our attorneys are available to meet with you at any time, whether it is at our office or at your home or in the hospital. We do not charge any fees upfront to start work on your truck accident claim, and we do not get paid unless we recover compensation for you. Contact us by phone or online for a free consultation today.